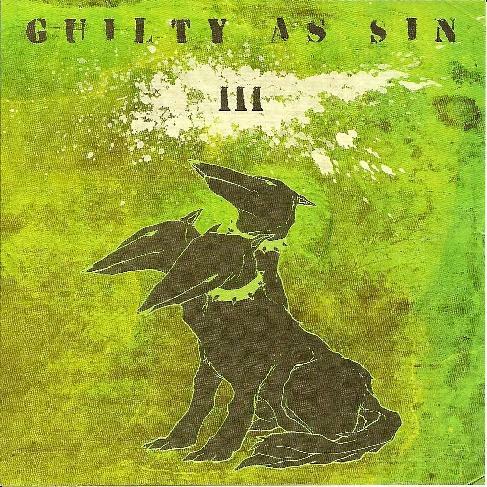 Guilty As Sin - "III"
Well! It's definitely NOT space rock! Guilty As Sin has a heavy Slayer influence to their music. Metalica and Iron Maiden are also here in various guises, making the CD, heavy, loud and raw throughout. Occasionally, we have a change in the script. We hear musings that are somewhat Progressive Rock in the sound, and somewhat out of place to the majority of trashy tracks. These musings take form with an improvisation feel to them, especially the track Planets, this is more flowing compared to the heavy Slayer styled tracks, and it takes the listener on a journey into places that sound familiar, yet seem unfamiliar in composition and execution. These elements are mixed hither and thither throughout the CD, but as I have said before, these pieces are more token gestures to alleviate the Slayer sounding stuff. We also, for token gesture, have an Arabic influenced track which is very different in every aspect to the whole CD, and more appealing to some I'm sure than the trash metal stuff. Why put it there? Why not do a concept thing making one track move through these different sounding phases gradually, as to allow the listener to take a journey through the build up, moving through into the heavy, and then motioning to wherever one feels it should go? If not, do a full on thrash album and be done with it, it would be better for it, as certain things are just out of place at certain times, but maybe that is the point! As far as the thrashy stuff goes, it is done well, and if you're into Slayer, Metallica and Iron Maiden then you possibly will like it, if not then you probably will not. It's really aimed at metal fiends, so we all know where we stand.